The yard sale ads come out on Thursday here. I was surprised to see a couple listed ... usually don't start up for another week or so. (I figure it conincides with the credit card bills coming in). Anyway, the only two listings in my circle were for both Friday and Saturday. So; went on Friday. 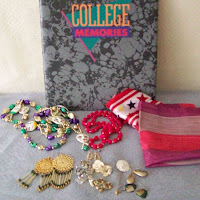 A 'College Memories' book that is blank pages of white heavyweight paper. I'll use this for my painted pages. Two scarves (I know ... I said I wasn't going to collect these anymore ... but what great colors). Several pairs of earrings ... both vintage clips and pierced. These are moving to the 'found objects' drawers. Bright pink 'thread' necklace. Wonderful beads. A Mardi Gras necklace ... All I want here is the face beads.